Here is a review of Steven Spielberg’s Ready Player One, a movie based on the bestselling novel about VR by Ernest Cline, and my thoughts on its impact on the VR industry. Don’t worry, there are no spoilers. FYI I didn’t read the book (I rarely have time for leisure anymore), so I’m not going to comment on its faithfulness to the novel. I’m reviewing only the movie itself. Ready Player One is set in a dystopian future where most people are poor and living in slums. To cope with their misery, people’s primary form of entertainment is a VR system called Oasis, where they can play out their fantasies. Oasis’ creator passes away but before he does so, he creates an easter egg somewhere in the vast Oasis universe, and announces that whomever finds it will become owner of Oasis, thus triggering a massive hunt for the easter egg. The hero, Wade Watts, an 18-year old from the slums, and his friends, are among the egg hunters (called gunters). Meanwhile, an evil corporation called IOI also seeks to find the easter egg to control Oasis, using armies of servants, many of whom were indentured to pay off their debts to IOI. The premise of the story is pretty much Willy Wonka set in the Matrix (moreso than Tron IMHO, due to the interactions between the virtual world and real world). In fact, in one of the movie’s trailer videos, the song is a remixed version of “Pure Imagination.” So in that sense, the plot is not at all unique and was predictable and the movie makes no attempt to pretend otherwise. But like any familiar story retold by a favorite uncle, it can still enthrall its audience. And in this case, that uncle is Spielberg, and this movie was fun and entertaining like Spielberg classics, and my family and I all enjoyed it. One thing that also made it fun for me and my wife was the incredible number of pop culture references (particularly anime and video games), and it was amazing to see so many licensed characters appear in the movie, from Hello Kitty to Aliens, from Akira to Halo. But even for my kids, who could recognize only a few of the references, it was still enjoyable. Before anything, if you’re hoping that Ready Player One will take VR mainstream, the answer is quite simply no. It will take much more than a movie to make people invest a few hundred dollars on a VR system. Having said that, the movie does give a little boost to the VR industry in several ways. First, the movie gave a realistic, not fanciful, depiction of VR. Many of the technologies shown in the movie are already possible, or even commercially available. For example, they showed an omnidirectional treadmill so that users could walk around in the virtual world. In that regard, there are already several omnidirectional treadmills IRL. Of course, we are still a long way from being able to create a virtual world like Oasis, but parts of it can be done today. In fact, there is already a Steam VR game in the works called Rise of the Gunters, which is made to look like the Planet Doom world in Oasis. If RPO viewers or readers decide to check out VR systems such as Rift or Vive, I think they might be pleasantly surprised with how closely current VR systems resemble the Oasis. Second, I liked how the movie showed that VR could be a device for the masses, not just for gadget lovers because it showed how VR can be used for almost any kind of experience. I did wish they had shown, even briefly, at least some educational or non-gaming uses for VR, or how VR can be used by people with disabilities, but I hope viewers still got an idea of how VR can be used by anyone. 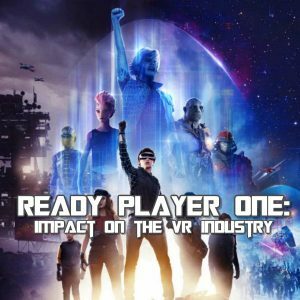 Third, even though VR was being overused by society in the world of Ready Player One (due to other social problems they were having), to the point where people were taking harmful actions in the real world, I thought that the movie still presented VR as being something generally positive. Fourth, and most important, I like the fact that the movie seemed to help the audience believe in the “reality” of VR. Here’s what I mean. Cynics could have easily questioned the premise of the movie and pointed out that it’s “just a video game” (indeed, at least one movie critic made that objection). However, reading people’s comments and other reviews, most people seemed to accept the characters’ existence in Oasis — and Oasis itself — as something worth preserving, something they cared about. This could arguably be interpreted to mean that they accepted it as nontrivial, with a form of significance, believability, and “reality,” albeit nonphysical. And just perhaps, this in turn might help them get a faint sense of what immersion feels like in VR. Thanks for the the enjoyable read. Great write up Mic! There could be a future for you as a professional film critic. I read the book last year after seeing the first teaser trailer. After watching the movie twice I come to enjoy it. To tell the truth, the first time I keep wanting to “correct” the movie making it harder to follow. The second time I was able to put the book aside and see the movie for what it is. Without giving away spoilers I do want to mention that the book does cover education uses for the OASIS. It also describes the OASIS as a kind of replacement for the internet so I am shocked to hear the “just a game” critique. I thought the movie also explained that people do everything in the OASIS but I guess it did not illustrate that this includes work, school, and play. Like the internet, most of the world economy is tied into the OASIS. It is also cool that the writer of the book Ernie Cline has answered questions about changes made in the movie. He helped write the screenplay and reading about why the changes where made lights up my inner nerd. I could nerd out more about RPO and it would seem fitting to the spirit of it but I better stop now! Thanks Denzel! Maybe someday if or when I magically have more time, I will read the book! 🙂 But from watching the movie only and not reading the book, it looked to me like Oasis was only for entertainment, even though that was actually wrong, as you said. You do an amazing job so I will not blame you for being too busy. Keep up the good work! Hi Francois. I wanted to watch in 3D but we watched the 2D version because my wife and daughter have vision problems watching 3D movies… I will definitely buy the Blu Ray 3D DVD when it is released so I can watch in 3D in my PSVR! According to an article (see link below), this movie was actually designed for 3D viewing so it might be worth seeing the 3D version. As to a Blu-Ray 3D release, don’t count on it. Ever since 3D TVs have been discontinued, very few movies released in 3D in theaters get released on Blu-Ray 3D in North America (although most do get released that way in Europe). Well if that’s the case, I can only hope that they do release it in 3D. And do’t forget the fresh series ‘Altered Carbon’ in which they also use virtuality, but much more brutal. For interrogation and torture. So, not everything is so cool with future applications of VR.